Electrochemical energy storage is a key technology of the 21st century. 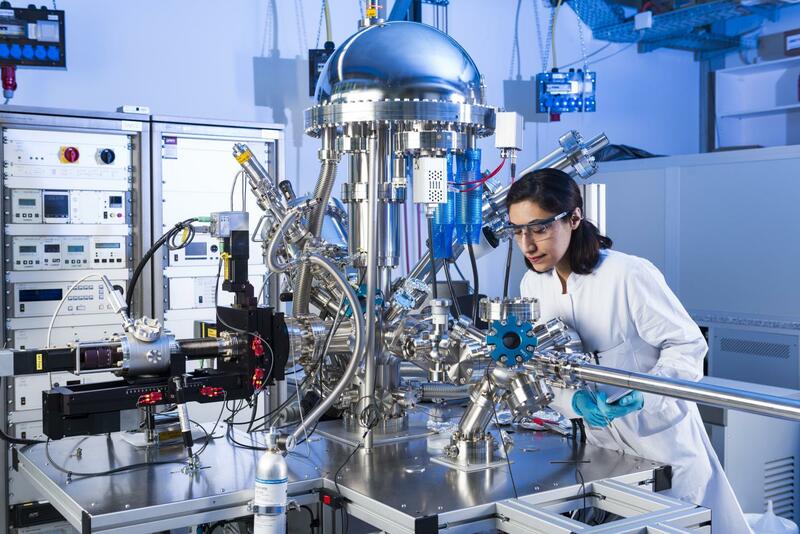 Now, the Center for Electrochemical Energy Storage Ulm & Karlsruhe (CELEST), one of the most ambitious research platforms in this area worldwide, has started operation. It combines finding-oriented research with close-to-practice development and innovative production technology. CELEST pools the know-how of 29 institutes of its partners, namely, Karlsruhe Institute of Technology (KIT), Ulm University, and the Center for Solar Energy and Hydrogen Research Baden-Württemberg (ZSW). Climate change and the decline of natural resources require mobility and energy systems to be prepared as quickly as possible for times without fossil fuels. Technologies for the storage of regenerative energy are urgently required. To accelerate research, academic education, development, and technology transfer in this area, KIT, Ulm University, and the ZSW established the Center for Electrochemcial Energy Storage Ulm-Karlsruhe (CELEST) that has now started work. "As scientists, we want to make major contributions to climate protection and the energy transition," says Professor Oliver Kraft, KIT Vice President for Research, with reference to the opening of the research platform in July. "With CELEST, we have established the biggest German research platform in the area of electrochemical energy storage." Not only finding-oriented research, but also the development and manufacture of batteries and fuel cells will become more powerful and visible in Baden-Württemberg. "Resarch into electrochemical energy conversion and storage has a long tradition at Ulm University," says Professor Joachim Ankerhold, Vice President for Research of Ulm University. "Since 2011, the strong partners KIT, Ulm University, and the ZSW, among others, have successfully pooled their expertise in battery research at the Helmholtz Institute Ulm located in the center of our Science City. The CELEST research platform raises our cooperation across different sites to the next level." "Batteries and fuel cells are key technologies for stable and secure power supply and zero-emission mobility based on renewable energy sources," says Professor Werner Tillmetz, Member of the Board of Directors of ZSW and Head of the Electrochemical Energy Technologies Division. "The role of ZSW in Ulm is to transfer technologies relating to batteries, fuel cells, and hydrogen to industry." CELEST is aimed at enhancing communication and cooperation among the scientists involved and paving the way for new, interdisciplinary collaborations. CELEST will also coordinate joint activities with other universities and research institutions as well as with industry in Germany and abroad and deepen existing contacts. "Scientists in Ulm and Karlsruhe have complementary expertise extending from basic experimental research into elementary processes on the atomic scale to multi-scale modeling of relevant processes and development of new storage materials and laboratory cells to the largest pilot plant for battery cell manufacture in Europe at the ZSW," says Professor Maximilian Fichtner, Director of the Helmholtz Institute Ulm, who was elected scientific spokesperson of CELEST. CELEST will cover the research areas of "Lithium-ion technology," "Energy storage beyond lithium," and "Alternative technologies for electrochemical energy storage," i.e. all highly topical issues in the area of electrochemical energy storage. Another focus lies on collaboration with industry partners for technology transfer, innovation, and commercialization of new technologies. A high priority of CELEST will also be the education of young scientists. For this purpose, a graduate school in the area of electrochemical energy storage will be established. New battery technologies also are the subject of the joint proposal of KIT and Ulm University for the Excellence Cluster "Energy Storage beyond Lithium: New Storage Concepts for a Sustainable Future." This cluster is to push the development of battery technologies based on abundant, low-cost, and non-toxic elements, such as sodium and magnesium and, thus, reduce the pressure on critical resources. The Center for Solar Energy and Hydrogen Research Baden-Württemberg (ZSW) and Gießen University are also partners of this proposal. Ulm University, the youngest university in Baden-Württemberg, was founded in 1967 as a higher education institution for medicine and natural sciences. The subject spectrum has been expanded considerably since then. The currently around 10,000 students are spread across four Faculties ('Medicine', 'Natural Sciences', 'Mathematics and Economics', and 'Engineering, Computer Sciences and Psychology'). Ulm University is the center of and driving force behind the Science City of Ulm, a dynamically growing research environment, including hospitals, technology companies, and other institutions. The University's research foci comprise life sciences and medicine, bio-, nano- and energy materials, financial services and their mathematical methods, as well as information, communication and quantum technologies.